We haven’t been talking about Star Wars much here at The A.V. Club, but that’s because we’re not sure anyone out there really cares about a wondrous space epic full of terrifying villains and inspiring heroes that fight each other with swords made out of lasers. For the handful of people out there who do think Star Wars is cool, though, Deadline is reporting that a new trailer for The Force Awakens will premiere tomorrow night during Monday Night Football on ESPN. (Football is a sport where huge men in tight pants run around and push each other, and we’re pretty sure it’ll never catch on either.) We don’t know when exactly the trailer premiere, which would be a nice incentive for people to watch ESPN all night if YouTube didn’t exist. Basically, you can watch the New York Whatevers play the Philadelphia Birds Of Some Kind tomorrow night and see the trailer live, or you can wait two minutes and see it on the internet. Assuming the trailer isn’t so unbelievably terrible that it somehow convinces you to no longer like Star Wars, Disney and a cabal of the country’s biggest theater chains have also announced that Monday will be the start of advance ticket sales for The Force Awakens. That means you won’t have to wait outside of your local theater for a few days in a poorly constructed Boba Fett costume if you want to make sure you get tickets. You can just stay at home, leave off the pants of your Boba Fett costume, and buy the tickets online. For record, the movie comes out on December 18, so make sure you have the night free. 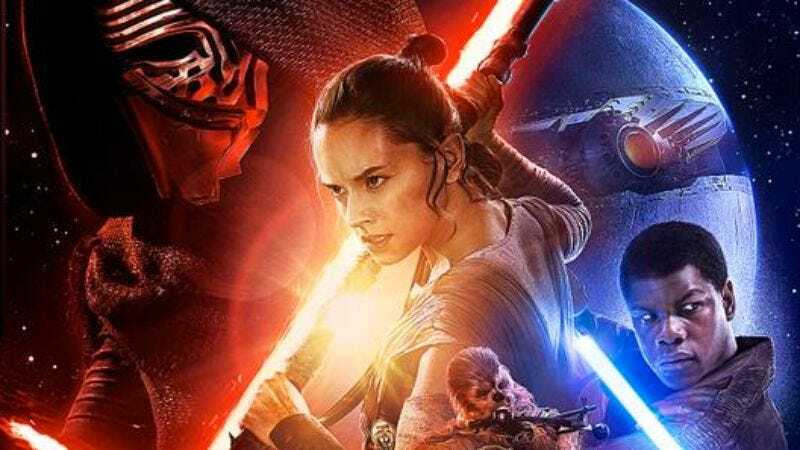 If you can’t stand waiting until tomorrow (or December) for more Star Wars, Lucasfilm has released a brand new poster that should help satiate your thirst for galaxies that are far, far away. It features all of your soon-to-be favorite new characters, from Kylo Ren and Captain Phasma to…the good guys, whose names aren’t as memorable. Han Solo and Leia even show up, though there is one notable Star Wars character who is suspiciously absent: Ponda Baba, the wlarus guy from the Cantina. Also, Luke Skywalker.